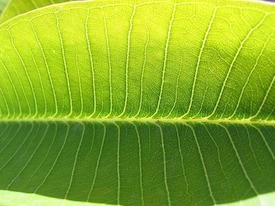 Researchers at the Massachusetts Institute of Technology (MIT) have created an artificial leaf that has the potential to provide an easy and limitless source of clean energy. The creation is a silicon wafer around the shape and size of a playing card, and coated on each side with two different catalysts. The silicon absorbs sunlight and passes the solar energy to the catalysts to split water into molecules of hydrogen and oxygen. Hydrogen can be burned or used in fuel cells to make electricity, and reforms into water either way. Theoretically, anyone with access to water could use it to develop clean and inexpensive fuel this way. It has been pointed out that there is still a long way to go with this technology, to make it viable for use in real-world conditions, but its low-cost potential could make it hugely scalable and accessible. The researchers have said that when the device is placed in a clear jar and exposed to sunlight, it creates a steady stream of oxygen and hydrogen flowing up to the surface. The setup converts 5.5% of the energy in sunlight into hydrogen fuel. The invention also seems to be stable. The research team had been operating the device for a week, using water from a nearby river, with no drop in efficiency over that time. The next step in the development process is to see if the device works well with seawater, which could have dramatic implications for lowering future costs further. That would be brilliant, and seems so clean and simple. Next post: Is Humankind Evolving Into A Global Superorganism?